B2 First is an exam for people who need to prove they can use everyday written and spoken English at an upper-intermediate level for work or study purposes. can be taken by people with a wide range of special requirements. Choose when and how you take your exam - B2 First is available as either a paper-based or computer-based exam, allowing you even more choice over how you take your test. Get your results in just two weeks if you take your B2 First as a computer-based exam. Once you have earned a Cambridge English certificate, you hold one of the most valuable English qualifications in the world. It’s an achievement you can be really proud of. What’s in the B2 First? The B2 First exam consists of four papers developed to test your English language skills in all areas of language ability: Reading and Use of English, Writing, Listening and Speaking. The Speaking exam uses a face-to-face test with two candidates and two examiners. This creates a more realistic and reliable measure of your ability to use English to communicate. The B2 First Reading and Use of English paper has 7 parts and 52 questions and has a mix of text types and questions. For Parts 1 to 4, candidates read a range of texts and do grammar and vocabulary tasks. For Parts 5 to 7, candidates read a series of texts and answer questions that test their reading ability and show that they can deal with a variety of different types of texts This paper accounts for 40% of the total mark. The B2 First Writing paper has two parts. Candidates have to show that they can write different types of text in English. In Part 1 there is one compulsory question and in Part 2 candidates answer one question from a choice of three. In part 1 they are given an essay title and two ideas clearly linked to the title. They write an essay giving their opinions about the title, using the ideas given. They must also add a third, different idea of their own linked to the title. The title will be a subject of general interest and candidates won’t need any specialised knowledge. In part 2 candidates write a text from a choice of text types: article, email/letter, report or review. To guide their writing, they will be given information about context, topic purpose and target reader. This paper accounts for 20% of the total mark. The B2 First Listening paper has four parts and 30 questions. For each part candidates have to listen to a recorded text or texts and answer some questions. The test requires candidates to be able to follow and understand a range of spoken materials, such as news programmes, presentations and everyday conversations. Monologues: answer phone messages, radio broadcasts and features, news, public announcements, stories and anecdotes, lectures and talks. Interacting speakers: conversations, interviews, discussions, radio plays. Candidates hear each recording twice. This paper accounts for 20% of the total mark. The B2 First Speaking has four parts and is conducted face-to-face with one other candidate and two examiners. One of the examiners, the interlocutor, conducts the test (asks questions, gives candidates the booklet with things to talk about). The other examiner, the assessor, listens to what the candidates say. Part 1 is a conversation with the examiner. The examiner asks questions and candidates may have to give information about their interests, studies, career, etc. In Part 2 the examiner gives each candidate two photographs and asks him/her talk about them. Each candidate has to speak for 1 minute without interruption and the interlocutor then asks the other candidate to comment on the photographs for about 30 seconds. Part 3 is a conversation with the other candidate. The examiner provides some material and a task to do. Candidates have to talk to each other and make a decision. Part 4 is further discussion with the other candidate, guided by questions from the examiner, about the topics or issues raised in the task in Part 3. The Speaking test accounts for 20% of the total mark. Almost all B2 First Speaking Tests are conducted in groups of two candidates. However, if there is an uneven number of candidates at an exam session there will be one test with a group of three candidates, normally at the end of the day or before a long break. The test format is exactly the same but will last a little longer. Please note that you cannot request to take your test in a group of three. Try a paper-based sample B2 First exam paper. (Please note that there is no answer key for the Writing paper, but there are sample answers and examiner comments). Find out how to use the computer-based sample tests. Please note you will need to use the Firefox or Chrome browser to view these sample tests. From January 2015 Cambridge English: First (FCE) results will be reported on the new Cambridge English Scale (replacing the current candidate profile and standardised scores). You will receive a Statement of Results. If your performance ranges between CEFR Levels C1 and B1, you will also receive a certificate. You will receive a separate score for each of the four skills (Reading, Writing, Listening and Speaking) plus Use of English, giving you a clear understanding of your performance. These five scores are averaged to give an overall result for the exam. You will also be given a grade and Common European Framework of Reference for Languages (CEFR) level. The exam is targeted at Level B2 of the CEFR. The examination also provides reliable assessment at the level above B2 (Level C1) and the level below (Level B1). 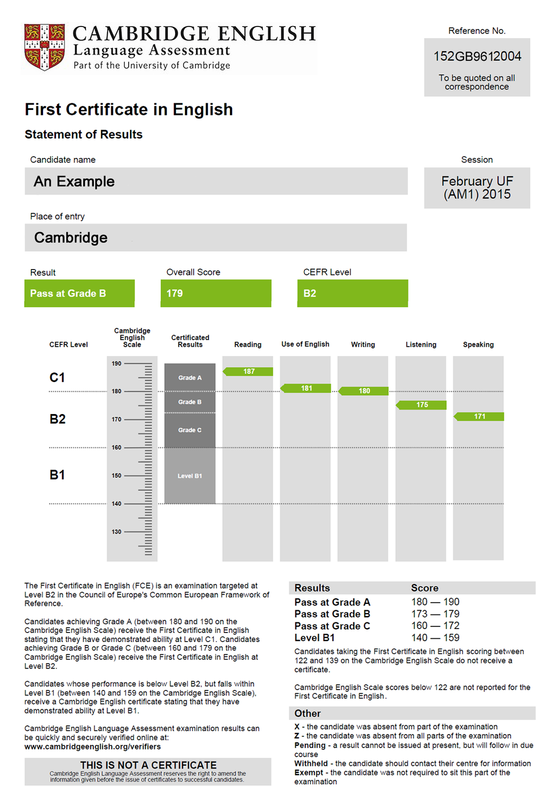 Scores between 122 and 139 are also reported for Cambridge English: First. You will not receive a certificate, but your Cambridge English Scale score will be shown on your Statement of Results. Please click on the image to the left of this text to find out the relationship between the CEFR levels, the Cambridge English Scale and the grades awarded in Cambridge English: First. Exceptional candidates sometimes show ability beyond B2 level. If you achieve grade A in your exam, you will receive the Cambridge English: First certificate stating that you demonstrated ability at Level C1. If you achieve grade B or C in your exam, you will be awarded the Cambridge English: First certificate at Level B2. If your performance is below Level B2, but falls within Level B2, we will recognise your achievement with a Cambridge English certificate stating that you demonstrated ability at B1 level.